WATCH What is the 'Ring of Fire'? 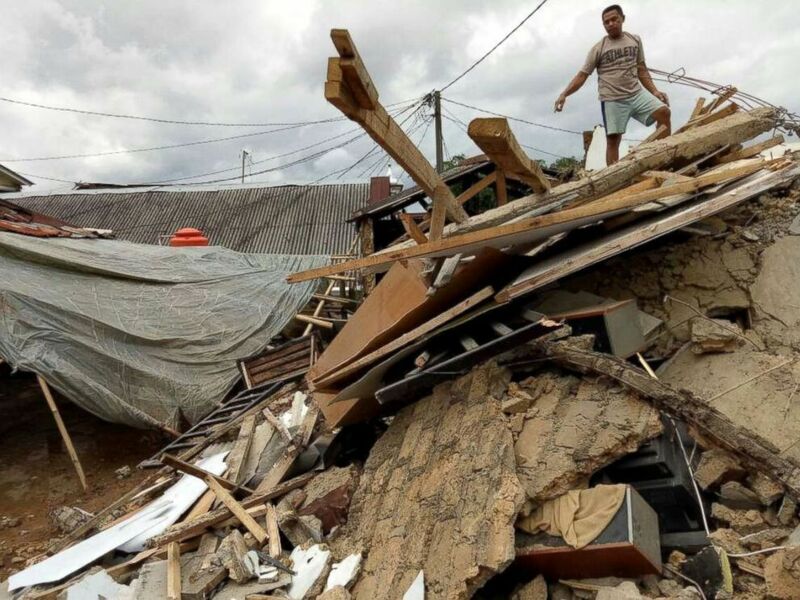 The volcanic eruption that likely sent a tsunami barreling into the Indonesian coast and killing at least 373 people on Sunday is among a rash of natural disasters this year that have one common denominator: They all occurred along the so-called "Ring of Fire." The latest calamity on the sprawling horseshoe-shaped geological disaster zone occurred early Sunday when the Anaka Krakatau volcano erupted and was followed 24 minutes later by a wall of water that slammed the east side of Java, causing widespread destruction and death, officials said. A man inspects his house which was damaged by a tsunami, in Carita, Indonesia, Sunday, Dec. 23, 2018. 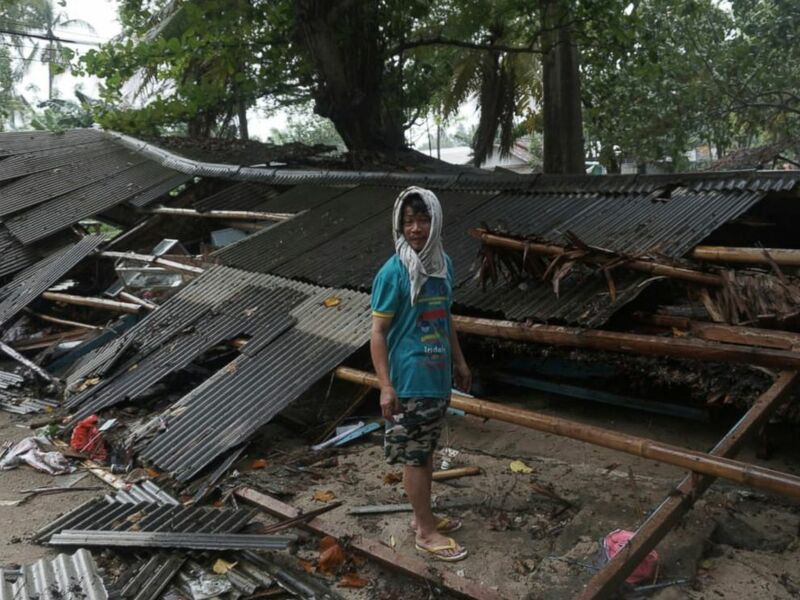 The Indonesian catastrophe came less than a month after a 7.0-magnitude earthquake hit Anchorage, Alaska, which is also on the Ring of Fire, causing widespread damage, but no reported deaths or injuries. Earlier this year, least five different events occurred on the Ring of Fire in a two-day span, including a magnitude 7.9 earthquake that rattled the town of Kodiak, Alaska, and the eruption of Mount Kusatsu-Shirane near a ski resort northwest of Tokyo. While the series of cataclysmic activity has come in rapid succession, scientists say most of them occurred thousands of miles apart and there is nothing to suggest they are connected. 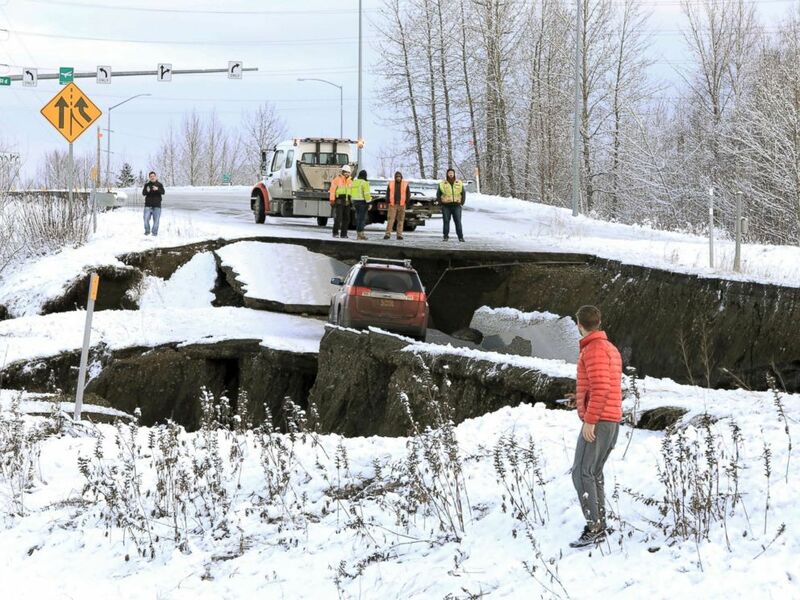 Highway workers and spectators look at a car stuck on a section of an off-ramp that collapsed during an earthquake in Anchorage, Ala., Nov. 30, 2018. "It's very unlikely that these things are related," William Yeck, a research geophysicist for the US Geological Survey, told ABC News. Yeck said the Ring of Fire, which encompasses 452 volcanoes and where more than 80 percent of world's largest earthquakes occurred, is constantly active. "This amount of activity isn't unusual," Yeck said. The Ring of Fire stretches 25,000 miles. It goes from New Zealand up through Indonesia, the Philippines and Japan, and then across the Aleutian Islands and down the coasts of Alaska, Canada, the West Coast of the United States and all the way down to the tip of South America. 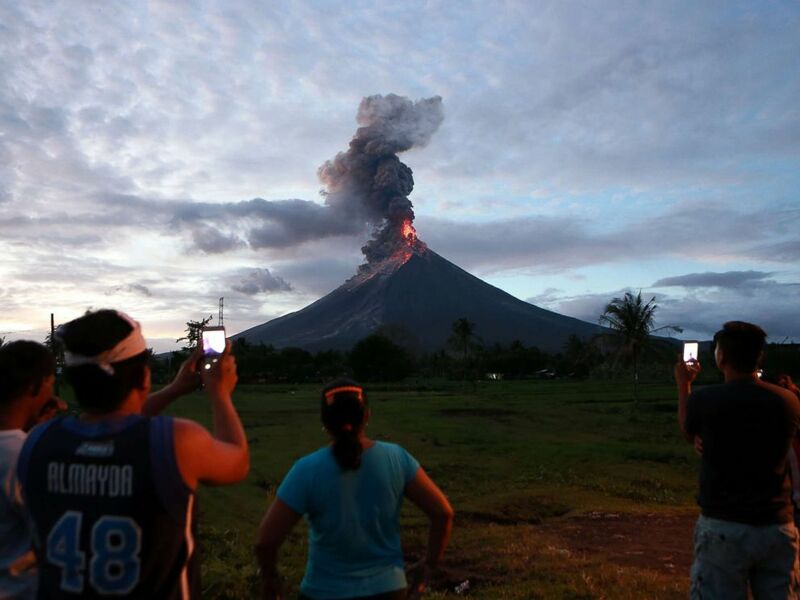 Residents watch the glowing lava flowing from the crater of the Mount Mayon volcano as it erupts in Albay Province, the Philippines, Jan. 23, 2018. "It's largely the Pacific plate that makes up the majority of it," Yeck said. But the ring also includes the Philippine Sea plate, Juan de Fuca and Cocos plates, and the Nazca Plate. The tectonic plates fit together like a puzzle, but are constantly moving and colliding with each other, thus producing numerous earthquakes. A resident stands on his damaged house after an earthquake at Megamendung village in Bogor, Indonesia, Jan. 23, 2018. In January, a magnitude 6.1 earthquake occurred off the southern coast of Java, Indonesia's mainland. Around that same time, Mount Agung in Bali and Mount Mayon in the Philippines blew their tops, spewing red-hot lava and causing the evacuations of thousands of people. In June, Volcan de Fuego in southwest Guatemala, also on the Ring of Fire, erupted and buried entire villages and killed nearly 160 people.